Alex Cochrane Architects has created a space for shoppers at London department store Selfridges to find peace and quiet amid the bustling emporium (+ slideshow). 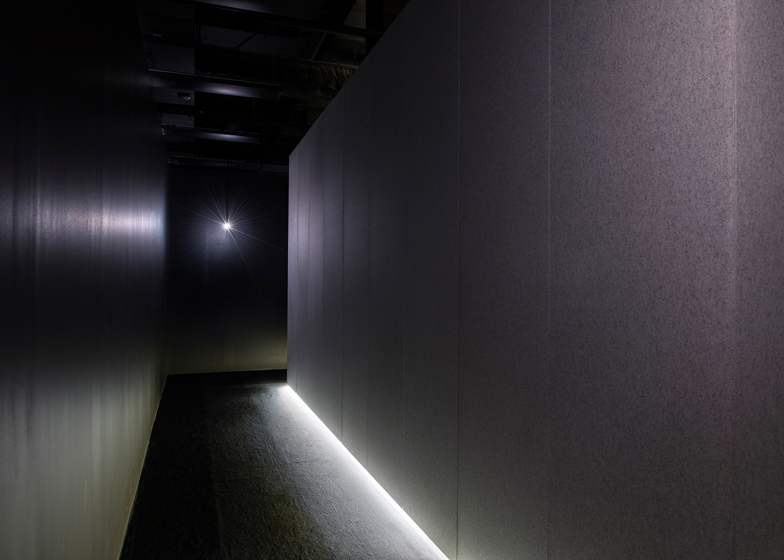 London studio Alex Cochrane Architects built the space on the lower ground floor of the Selfridges as their interpretation of a previous silence room created by the store's founder when it first opened in 1909. 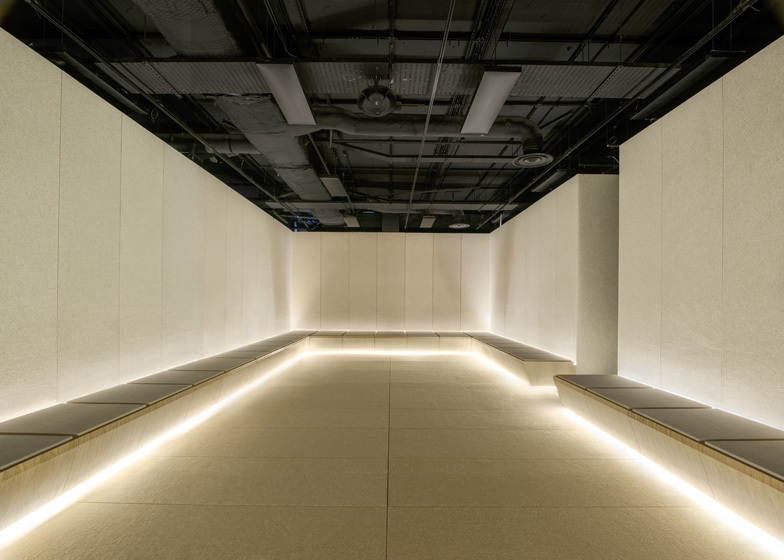 "Gordon Selfridge did a Silence Room many years ago, and sadly there're no records of what that room looked like so we did our own version of what the Silence Room might be," Alex Cochrane told Dezeen. 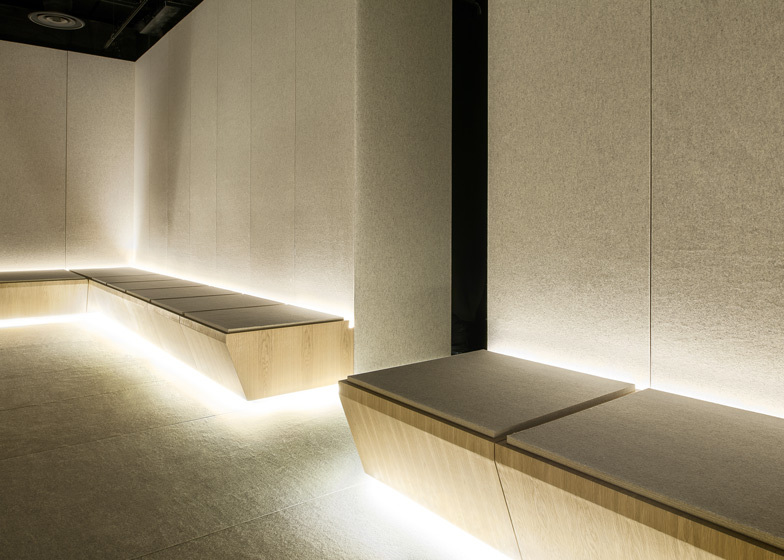 Next to a major thoroughfare, adjacent to a cafe and flanked by two lifts, the space is not intended to be completely silent but rather encourage visitors to lower their voices and take time to unwind. "Our take from the beginning was that there was always going to be background noise and we really wanted to create a room that people can feel silent in regardless of that," said Cochrane. 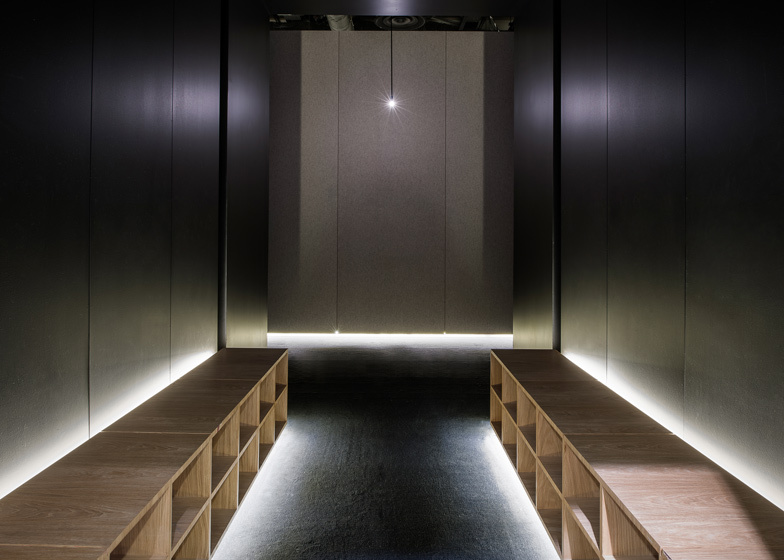 After removing their shoes, visitors are channeled into a dark corridor with light bulbs hung in each corner to guide them around the back of the rectangular box and through a gap in the wall. 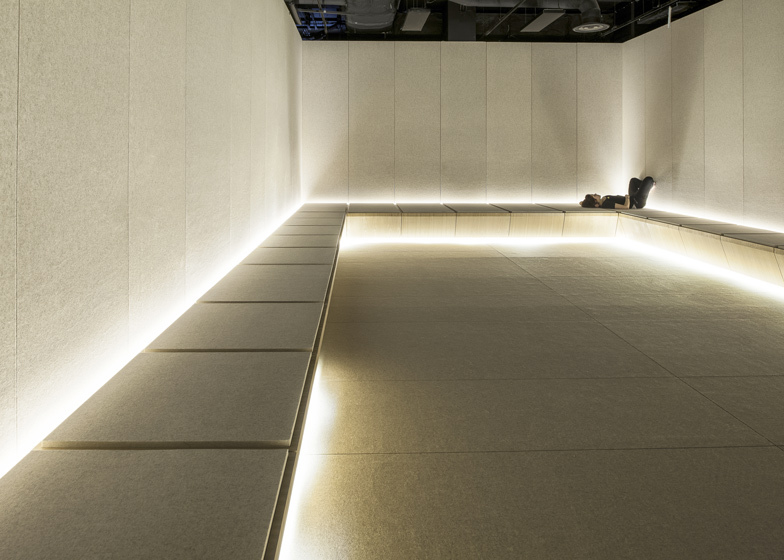 Cream felt covering the walls, floor and seats helps to insulate some of the sound and provide comfortable surfaces to relax on once inside. "We’ve seen people sleeping there, meditating there. One person was seen praying there," Cochrane said. A modular bench finished in oak veneer wraps around the edge of the room, becoming deeper at the shorter ends of the room to provide extra space to lie down. 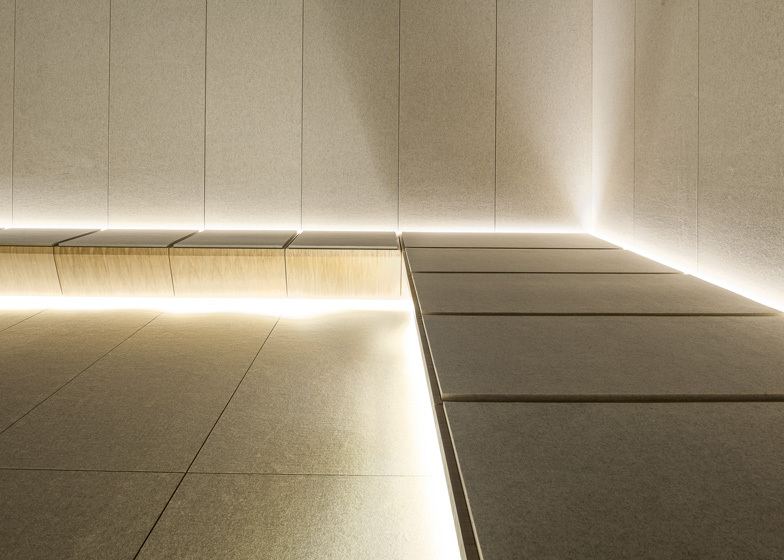 LED lighting hidden at floor level and behind the seating creates an ambient glow. Services and ductwork on the ceiling remain exposed but painted black as a subtle reminder of the nature of the building. 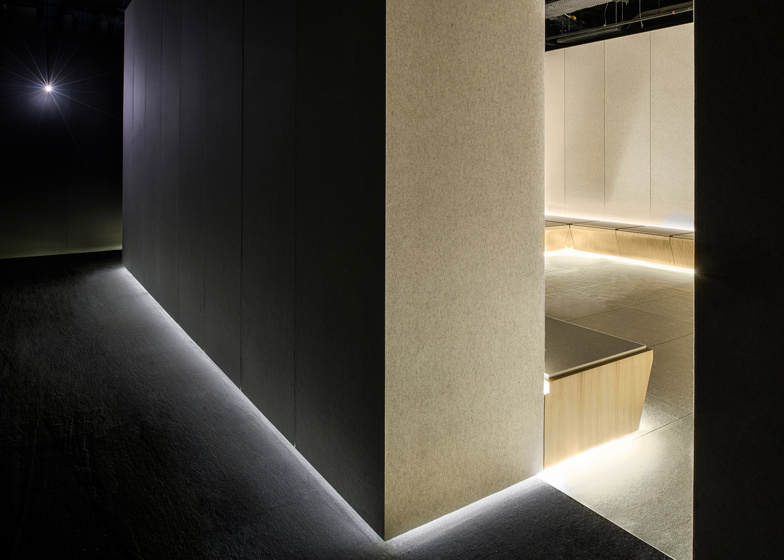 "Similar to the background noise, we wanted to keep the visual noise from the ceiling. We wanted it to serve as a reminder of being in a commercial institution such as Selfridges," Cochrane explained. The Silence Room was created for the store's No Noise campaign, which also includes the sale of limited edition products with no brand names. Alex Cochrane Architects also designed the Men's Designer Space at Selfridges and we've also featured a renovated Victorian boathouse by the studio. Photography is by Andrew Meredith.